Liverpool, England is one of the liveliest cities in the United kingdom—a city that hosts a number of bars, pubs and nightclubs, most offering some type of live entertainment, including many that sponsor open mic nights for up and coming singers, musical acts, comics, and other artists. 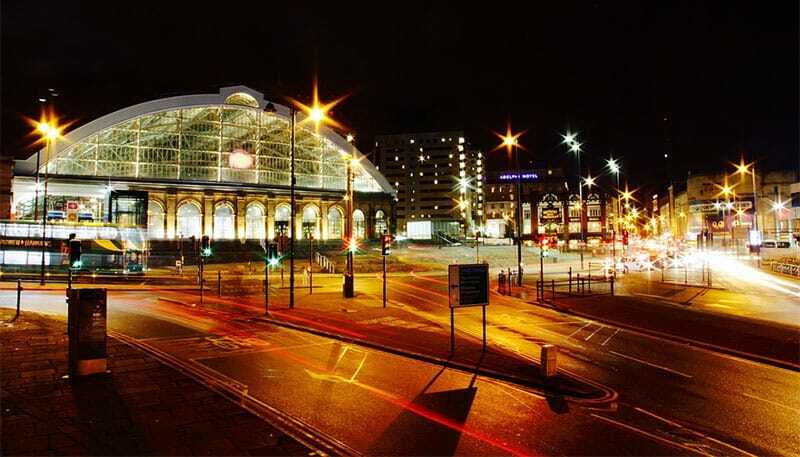 The incredible variety of nightspots is what truly makes Liverpool so attractive to partygoers. Here you can find any type of venue that suits your interests or mood, including enormous, rocking super-clubs; back-alley pubs and bars; a thriving gay quarter with several different clubs; comedy shops boasting both new and proven talent; large dance warehouses; and a wide selection of concept bars. In the following piece we will explore some of Liverpool’s best and most popular bars and clubs, specifically those that offer open mic nights for musicians, comedians and other talent. In doing so we will discuss the various amenities, characteristics and genres associated with these clubs, the open mic process they have put in place for new talent, and some of the reasons why each of these hotspots have become so popular throughout the city. Located at 121-123 Dale Street, in the middle of Liverpool’s city center, the Excelsior is a fantastic English pub and a wonderful destination for an entertaining night out. Here partygoers can enjoy a pint from one of several different taps and snack on some delectable pub grub, including hamburgers, bangers, lasagna and a number of curry-based snacks. The bar also hosts regular open mic nights, where amateur singers and musicians can play for the raucous crowd while trying out some of their newest material. The atmosphere at the Excelsior is warm and inviting, with a casual, welcoming décor that makes customers feel right at home. The bar itself accommodates about 25 patrons, but there is also ample seating scattered throughout the establishment, including some large tables where groups of happy revelers can sit together and chat. Many different types of beer and ale are offered at the Excelsior, including Cains, Liverpool’s Finest and Rev. James, all of which are popular among the many regulars that call this pub home. Open mic nights, from 8 PM until about midnight, are offered on Wednesday and Friday nights. The musical genres vary from one artist to the other, and most of the performers are students and young people who reside at or near the nearby university. JR’s Bar and Grille in Liverpool is another lively city center bar and eatery that is typical of many of the other bars in this region of the United Kingdom. Nestled among many other businesses (and near a number of other pubs), JR’s Bar and Grille is located at 53 Great Charlotte Street, and draws an impressive number of patrons given the stiff competition in the area. The bar is especially popular—and quite patriotic—during large sporting events like the World Cup, with customers wearing their colors and cheering for the local team. On certain nights of the week, JR’s Bar and Grille hosts open mic nights in their small bandstand/stage area. Here performers and musicians, ranging from seasoned professionals to first-time singers, can ply their trade as onlookers relax and/or dance to the pleasant sounds. Reasonable drink prices, tasty food and a welcoming atmosphere combine to lure a good number of customers to this pub—a place where the performers can feel relaxed and appreciated. Looking for a cheap place to drink and socialize? If so, the Pilgrim Bar is definitely the place for you. The underground, cellar bar in Liverpool is tucked away on an old cobbled street, and although it can be a little difficult to find it is definitely worth the effort. The bar has a fantastic selection of music on its jukebox and the Carlsberg bottles (of beer), priced at just 1 pound apiece, as well as the free Wi-Fi, makes the bar very popular among students. In addition to the reasonably-priced beer and cocktails at the Pilgrim Bar, and the tasty, yet limited selection of grub, the destination offers a rocking open mic session a couple times each week, where singers and acoustic musicians can walk on stage and jam together as partygoers look on and cheer. Liverpool is well-known for its multitude of “crossover” bars, one of which is the Irish-styled Pogue Mohone. This extremely entertaining pub is representative of many of the bars in the Irish Motherland—a place where the Guinness flows freely and the patrons are always warm and friendly. Pogue Mohone not only has several great beers on tap and a great food menu, it also hosts a number of popular theme nights, including their Friday night “Open Mic Jam Session,” where up-and-coming singers and songwriters, across the musical spectrum, can perform—and hopefully get noticed. Situated at 5-9 Victoria Street in Liverpool’s Cavern Quarter, the Metro Bar is a French-themed establishment that also happens to host an open mic night every Tuesday and Wednesday night. The open mic night at this bar is perfect for songwriters and acoustic artists that think they have what it takes to be on center stage. The quaint Metro Bar has a pastoral and quite welcoming atmosphere with a hint of Old World France; the décor includes Parisian images on the wall, comfortable seating and more than its fair share of live entertainment. The place is particularly suited for the musically-inclined, featuring live Jazz jam sessions in which everyone is invited to perform. The Metro Bar is located in a basement area and offers plenty of room to dance. There are an abundance of plush seating booths for relaxing, and the staff is warm and friendly. Most of the clientele lean toward the artsy side, from philosophers to musicians, and wine is the most popular order. There is also bottled beer on offer, including the brands Sabai and Tiger.